2015 Kenworth T-370 --- Single Axle, PX-9 Paccar, Allison Automatic 5 Speed, 4.78 Ratio, 12,000 Front Axle, 21,000 Rear Axle, 178" Wheelbase, 14' 10" Bridge, Air Ride, Air Brake, Exhaust Brake, Axle Lock, 14' Adkins Body, Steel Wheels, Single Stack, Fuel Tank, Daylite Doors, Peep Window, Dual High Back Seats, High Level Interior, Chrome Gauge Package, Heated Mirrors, Cruise Control, Tilt & Telescopic Steering Wheel, AM/FM, Power Windows, P/L, P/S, AC. 2015 Kenworth T-370 --- Single Axle, PX-9 Paccar 350 HP, Allison Automatic 5 Speed, 4.78 Ratio, 12,000 Front Axle, 21,000 Rear Axle, 180" Wheelbase, Air Ride, Air Brake, Exhaust Brake, 14' Adkins Body, Steel Wheels, Single Stack, Aluminum Fuel Tank, Daylite Doors, Peep Window, Dual High Back Seats, High Level Interior, Chrome Gauge Package, Heated Mirrors, Cruise Control, Tilt & Telescopic Steering Wheel, AM/FM CD, Power Windows, P/L, P/S, AC. New Arrival 2015 Ford F350 Crew Cab --- Single Axle, 6.2 V8 Gasoline Ford 385 HP, Automatic, 4,850 Front Axle, 9,750 Rear Axle, 176" Wheelbase, 14' 8" Bridge, Spring, 9' Knapheide Body, Dual High Back Seats, Cruise Control, Tilt Steering Wheel, AM/FM, Power Windows, P/L, P/S, AC. 2014 Dodge Ram 4500HD --- Single Axle, 6.7L Cummins, Automatic, 7,000 Front Axle, 12,000 Rear Axle, 168" Wheelbase, 14' Bridge, Spring, Exhaust Brake, Pintle Hitch with Electric Brakes, 11' Steel Knapheide Body, Steel Wheels, High Level Interior, Cruise Control, AM/FM, Power Windows, P/L, P/S, AC. 2011 Dodge RAM 3500HD --- Single Axle, 5.7L Hemi , Automatic, 5,200 Front Axle, 9,350 Rear Axle, Spring, 9' Steel Reading Body, Steel Wheels, Tilt Steering Wheel, AM/FM CD, P/S, AC. 2009 Ford F750 --- Single Axle, C7 Caterpillar 215 HP, Manual 6 Speed, 10,000 Front Axle, 21,000 Rear Axle, 158" Wheelbase, 13' 2" Bridge, Spring, Reese Hitch, Single Stack, High Level Interior, Cruise Control, Tilt Steering Wheel, AM/FM, P/S, AC. 2009 GMC C6500 --- Single Axle, DURAMAX, Allison Automatic, 10,000 Front Axle, 19,000 Rear Axle, 249" Wheelbase, 20' 9" Bridge, Spring, Single Stage Engine Brake, Electric/Hydraulic Brakes, Exhaust Brake, Aluminum Front Wheels, Aluminum Rear Wheels, Engine Heater Plug, Aluminum Fuel Tanks, Air Ride Seats, High Level Interior, Heated Mirrors, Cruise Control, Tilt Steering Wheel, AM/FM CD, P/S, AC. 2008 Ford F-750 XLT --- Single Axle, C-7 Caterpillar 230 HP, Manual 6 Speed, 12,000 Front Axle, 21,000 Rear Axle, 158" Wheelbase, 13' 2" Bridge, Spring, Air Brake, Reese Hitch, 11' IMT Service Body, Steel Wheels, Engine Heater Plug, Single Stack, High Level Interior, Cruise Control, Tilt Steering Wheel, AM/FM CD, Power Windows, P/L, P/S, AC. 2008 Ford F750 --- Single Axle, C7 Caterpillar 210 HP, Manual 6 Speed, 10,000 Front Axle, 21,000 Rear Axle, 158" Wheelbase, 13' 2" Bridge, Spring, 11FT' TITAN AUTO CRANE Body, Steel Wheels, Single Stack, Aluminum Fuel Tank, High Level Interior, Cruise Control, Tilt Steering Wheel, AM/FM Cassette, P/S, AC. 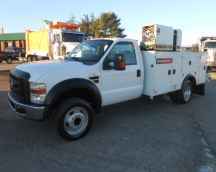 2008 Ford F750 --- Single Axle, ISB 6.7 Cummins 280 HP, Manual 7 Speed, 4.88 Ratio, 12,000 Front Axle, 21,000 Rear Axle, 158" Wheelbase, 13' 2" Bridge, Spring, Exhaust Brake, Reese Hitch, Steel Wheels, High Level Interior, Cruise Control, Tilt Steering Wheel, AM/FM, P/S, AC. 2008 Ford F550 --- Single Axle, 6.4 Powerstroke 325 HP, Manual 6 Speed, 6,500 Front Axle, 13,660 Rear Axle, 165" Wheelbase, 13' 9" Bridge, Spring, Steel Wheels, High Level Interior, Cruise Control, Tilt Steering Wheel, AM/FM CD, Power Windows, P/L, P/S, AC. 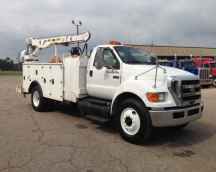 2007 FORD F-750 --- Single Axle, C-7 Caterpillar 210 HP, Manual 6 Speed, 12,000 Front Axle, 21,000 Rear Axle, 158" Wheelbase, 13' 2" Bridge, SPRING, Air Brake, 11' Steel AUTOCRANE Body, Steel Wheels, Single Stack, Aluminum Fuel Tank, Air Ride Seats, High Level Interior, Cruise Control, Tilt Steering Wheel, AM/FM, P/S, AC. 2007 Ford F750 --- Single Axle, C7 Caterpillar 210 HP, Manual 6 Speed, 10,000 Front Axle, 21,000 Rear Axle, 158" Wheelbase, 13' 2" Bridge, Spring, 11'' Autocrane Body, Aluminum Front Wheels, Steel Rear Wheels, High Level Interior, Cruise Control, Tilt Steering Wheel, AM/FM CD, P/S, AC. 2007 Ford F750 --- Single Axle, C7 Caterpillar 210 HP, Manual 6 Speed, 10,000 Front Axle, 21,000 Rear Axle, 158" Wheelbase, Spring, Air Brake, Reese Hitch, Steel Wheels, Single Stack, Aluminum Fuel Tank, Air Ride Seats, Cruise Control, Tilt Steering Wheel, AM/FM, P/S, AC. New Arrival 2007 Freightliner M2 --- Single Axle, C7 Caterpillar 250 HP, Allison Automatic 6 Speed, 6.43 Ratio, 13,300 Front Axle, 23,000 Rear Axle, 187" Wheelbase, Spring, Double Frame, 16' Altec Body, Steel Wheels, Aluminum Fuel Tank, Dual High Back Seats, High Level Interior, Cruise Control, Tilt & Telescopic Steering Wheel, AM/FM, AC. New Arrival 2007 Ford F550 --- Single Axle, 6.0 Powerstroke 325 HP, Automatic, 6,500 Front Axle, 13,500 Rear Axle, 140" Wheelbase, Spring, 9' Stahl Body, Steel Wheels, Tilt Steering Wheel, AM/FM, P/S, AC. 2006 Ford F750 --- Single Axle, C7 Caterpillar 210 HP, Manual 6 Speed, 10,000 Front Axle, 21,000 Rear Axle, 158" Wheelbase, 13' 2" Bridge, spring Spring, Air Brake, 11' IMT Body, Steel Wheels, Single Stack, Aluminum Fuel Tank, Air Ride Seats, High Level Interior, Cruise Control, Tilt Steering Wheel, P/S, AC. 2006 Ford F750 --- Single Axle, C7 Caterpillar 210 HP, Manual 6 Speed, 10,000 Front Axle, 12,000 Rear Axle, 158" Wheelbase, SPRING, Air Brake, Steel Wheels, Aluminum Fuel Tank, Air Ride Seats, High Level Interior, Cruise Control, Tilt Steering Wheel, AM/FM CD, P/S, AC. 2006 Ford F750 --- Single Axle, C7 Caterpillar 210 HP, Manual 6 Speed, 10,000 Front Axle, 21,000 Rear Axle, 158" Wheelbase, 13' 2" Bridge, Spring, Steel Wheels, Single Stack, Aluminum Fuel Tank, High Level Interior, Cruise Control, Tilt Steering Wheel, AM/FM, P/S, AC. 2006 Ford F750 --- Single Axle, C7 Caterpillar 230 HP, Automatic, 10,000 Front Axle, 21,000 Rear Axle, 168" Wheelbase, 14' Bridge, Spring, Air Brake, 11 Ft' IMT Body, Steel Wheels, Engine Heater Plug, Single Stack, Aluminum Fuel Tank, High Level Interior, Cruise Control, Tilt Steering Wheel, AM/FM CD, P/S, AC. 2005 Ford F750 --- Single Axle, C7 Caterpillar 210 HP, Manual 6 Speed, 10,000 Front Axle, 21,000 Rear Axle, 158" Wheelbase, 13' 2" Bridge, Air Brake, IMT Body, Steel Wheels, Aluminum Fuel Tank, Heated Mirrors, Cruise Control, Tilt Steering Wheel, AM/FM, P/S, AC. 2005 Ford F750 --- C7 Caterpillar 275 HP, Allison Automatic 5 Speed, 12,000 Front Axle, 21,000 Rear Axle, 194" Wheelbase, 16' 2" Bridge, Spring, Air Brake, Reese Hitch, 11' Stahl Body, Engine Heater Plug, Aluminum Fuel Tank, High Level Interior, Cruise Control, Tilt Steering Wheel, AM/FM, P/S, AC. 2005 FORD F450 XL SD --- Single Axle, 6.0 Powerstroke, Automatic, 6,000 Front Axle, 12,000 Rear Axle, 165" Wheelbase, 14' Bridge, Spring, Reese Hitch, 11' Steel Reading Body, Steel Wheels, Cruise Control, Tilt Steering Wheel, AM/FM CD, P/S, AC. 2005 FORD F350 XL SD --- Single Axle, 6.0 Powerstroke, Automatic, 4,850 Front Axle, 9,750 Rear Axle, 175" Wheelbase, 15' Bridge, Spring, 9' Steel Body, Steel Wheels, Cruise Control, Tilt Steering Wheel, AM/FM CD, P/S, AC. 2005 Cheverolet 7500 --- Single Axle, 6.6 Duramax 300 HP, Manual 6 Speed, 10,000 Front Axle, 19,000 Rear Axle, 152" Wheelbase, Spring, Air Brake, 11' Adkins Body, Single Stack, Cruise Control, Tilt Steering Wheel, AM/FM CD, P/S, AC. 2002 Sterling Acterra --- Single Axle, 3126 Caterpillar 250 HP, Eaton-Fuller Manual 6 Speed, 3.90 Ratio, 8,000 Front Axle, 17,500 Rear Axle, 177" Wheelbase, 14' 0" Bridge, Spring, Air Brake, 13' Steel Maintainer Body, Steel Wheels, Aluminum Fuel Tank, Dual High Back Seats, Air Ride Seats, Cruise Control, AM/FM CD, P/S, AC. 2000 International 4700LP --- Single Axle, T444E International 190 HP, Allison Automatic 5 Speed, 4.44 Ratio, 8,000 Front Axle, 18,500 Rear Axle, 172" Wheelbase, 14' 4" Bridge, Spring, 12' Body, Steel Wheels, High Level Interior, Cruise Control, AM/FM Cassette, P/S, AC.